About 2 years ago, I became a bit obsessed with quinces. Unfortunately, I didn’t really know what to do with them. So I turned to google and found a number of intriguing recipes, including this one for Quince Chutney. I made an offhand (and somewhat undiplomatic) comment about how jealous I was of the fact that Sarah, the author, had access to plentiful quinces and, ahem, a mum who could cook. Fast forward to this year and my mum develops her own obsession with quinces and, at around the same time, acquires an Ipad. I then receive an email from her directing me to the comment I had made and saying “LOOK WHAT I FOUND! And I beg to differ, I can cook.” Whoops! When did mums get computer literate? It’s left me wondering what other comments I’ve made now. Anyway, I think it is a testament to her good humour and tolerance that the next time she saw me she gave me a big bag of quinces. 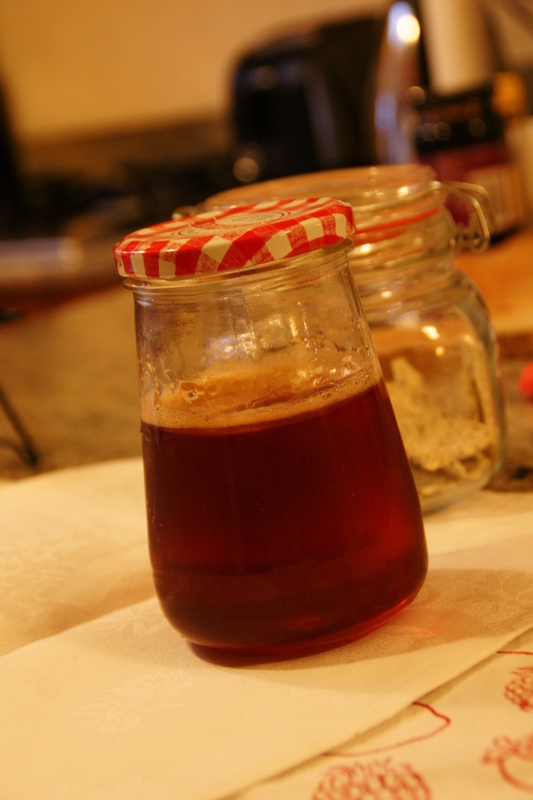 From which I made quince and orange jelly from Stephanie Alexander’s The Cooks Companion. The recipe involved chopping and basically stewing half your quinces, then draining that and adding the other half of the quinces (sliced but not peeled) and the oranges (Seville – peeled and chopped). This was cooked for another hour then drained in muslin. This was then drained for a few hours and the pulp discarded (or removed for later use in a cake). 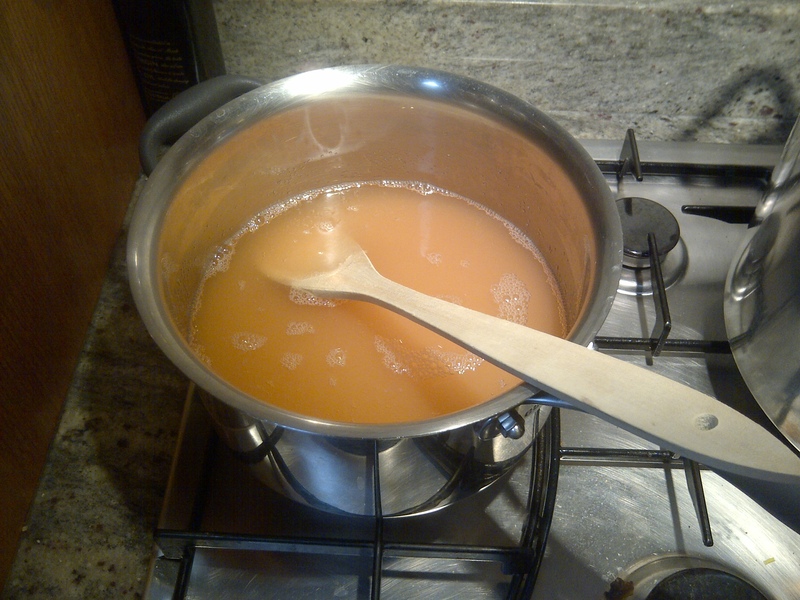 The juice was then weighed before an equivalent volume of sugar was added.This mixture was then boiled until setting stage. It took ages to get to setting stage for some reason. I had a bit of a disaster when pouring the jelly in to the jars because it bubbled up and went everywhere. So I ended up with a few half jars, for which I would certainly not win a prize at the Easter Show. It’s also got some foam on the top, which it shouldn’t. But isn’t it pretty! I then made a quince cake to use up the left over quince pulp. I used another Stephanie Alexander recipe – this time her quince and almond cake recipe. It used a whole block of butter! Lucky it was tasty. I also left out the nuts due to the nut-allergic husband. 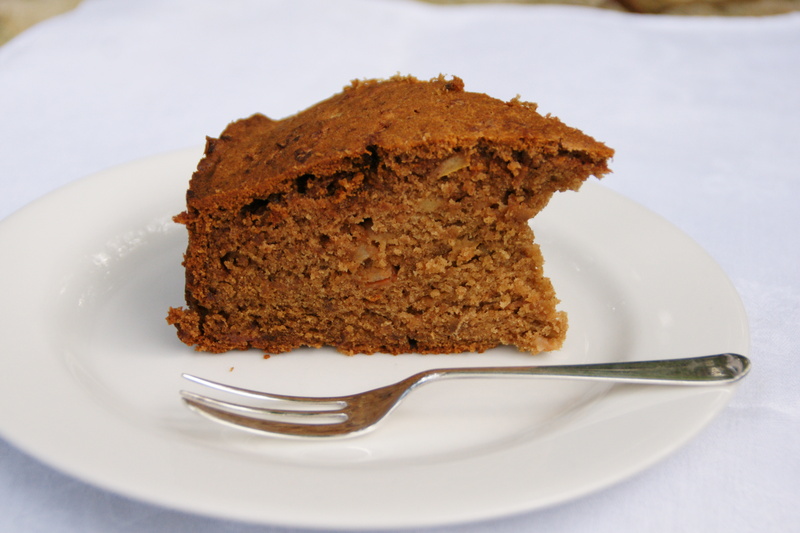 I can recommend the cake – it was surprisingly light and not too sweet, with a delicious crumb. Hi Amanda, it’s great to see that you are making jelly. When I make quince jelly, I use the pulp to make quince paste. It’s quite easy to make and can keep for ages. Hello Emmanuelle, and congratulations! I considered making quince paste but was worried we wouldn’t end up eating it and it would go to waste. As it turned out Tony decided the cake wasn’t sweet enough and refused to eat it, so it went in the bin – such a waste! I’ll definitely go for the paste next time.